Situated on the tip of legendary Negril Beach, life at Hedonism II centers a big part of what makes the spirit of Hedonism II so enjoyable. 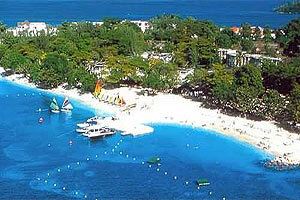 Located 55 Miles From Montego Bay/ On The Northern End Of Negril Beach. Hedonistic *Swinging* Super Club Resort Village For Couples And Singles Over 18. Set On 22 Lush/ Secluded Acres At The Northern End Of Negril Beach Consists Of Eight 2-Story Buildings That Have 280 Units. Casual Buffets Provide Non-stop Dining. The Resort Has A Private Beach With A Clothing Optional Section. Additional Features Include Candlelight Dining Room/ Piano Bar/ Disco/ Gym/ Swimming Pool/ 2 Jacuzzis/ 6 Tennis Courts/ Water Sports And Windsurfing School And A Clothing Optional Beach.